Chickadvisor announced a huge Vichy campaign for their Product Review Club members today! 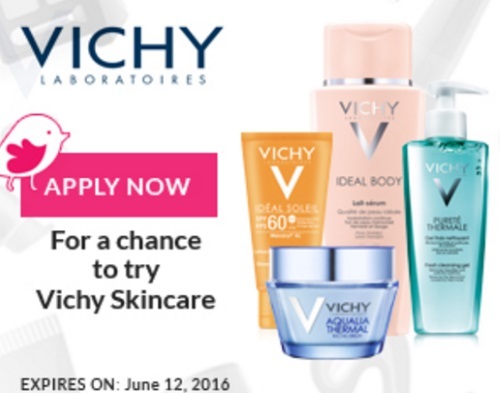 They are looking for 3000 women to take part in trying out a range of Vichy skincare for free for review! If you are selected you will try one of 10 skincare routines! The Vichy Skincare routines are designed to address everything from acne or anti-aging to soothing hydration or the universally important sun protection, so whatever your skin care need, there’s a Vichy product line for you! If you would like the chance to be 1 of those lucky 3,000 Chicks, please take a moment to complete the selection survey no later than June 12, 2016. If you are selected, you will be notified via email the week of June 13, 2016. Improve your chances of being selected by helping spread the word on social media! Be sure to include #VichyWorksForMe when you post on Twitter, Instagram, Facebook or Pinterest.